Today, Bernie and I decided to take the boys on an impromptu trip through the Berkshire hills today. A friend of mine had recommended Mass MOCA - the "Massachusetts Museum of Contemporary Art" located in North Adams. They have a third-floor "Kidspace" section which is free on Saturday and Sunday afternoons. I love art museums. I was an art major in college and actually interned at an art museum one summer. I feel so at home among works of art - they give me energy and bring me happiness. It was a two-hour ride to the museum and my children are not the best of travelers, although they are getting better. We stopped for a break after an hour each way and that seemed to help. We all survived in tact. The children loved the museum - they are having a special exhibit on musical instruments created out of found objects. We were the only ones there and the young woman working the exhibit was so kind to the boys. She got right down on the floor with them and helped them make guitars out of cereal boxes and rubber bands. They were in their glory! It really was a wonderful day - 5 year old David said, "It was the most fun I've had all week!" and he is looking forward to making more instruments tomorrow. The last time I had been up in that section of our state was in 1999 when Bernie and I had spent a wonderful vacation staying at a Bed and Breakfast and exploring Williamstown - the home of Williams College and the Clark Art Museum. Needless to say, our lives have changed a great deal since then. In the days before the children came along, we would spend our free time exploring antique shops, used bookstores, and art museums. In good weather, we also played quite a bit of tennis. Needless to say, those days are now firmly behind us. We now spend our time in kid-friendly locales. We spend much time at the park. The only museums we visit are ones that cater to kids. The bookstores have been replaced by the library (what would we do without the library?!) And the tennis that gets played involves gently bouncing a ball to David and Isaac so that they can try to hit it. Parenting does require sacrifices, some small and some large. Some sacrifices (like not having regular nights of sleep when the children were very young) are more painful than others. Some cause you to make substitutions to feed the need within you. For example, I now feed my need for art and beauty by reading art and home decor magazines. One thing that I have realized, however, is that the sacrifices are very temporary. Sure, it doesn't feel that way sometimes. As I spent night after night up with Isaac (who did not sleep through the night until he was two), there were times I felt that I could not survive one more day. Looking back, however, the time seems to have passed in a blink of an eye. The same with taking trips in the car. When David was very small, he could not bear to be in the car for more than a half-hour. He would scream and wail and kick. Now the kids entertain each other. They look at magazines and play with toys and talk to one another. This makes trips like the one we took today possible. And yes, I know the day will come when I can actually take the boys to a grown-up art gallery and trust that they will not touch anything. The day will also come when Bernie and I will again be alone and we will have the opportunity to revisit some of our old haunts, and perhaps discover some new ones. While that is something to dream about, I am in no rush to get there. Yes, parenting does require sacrifice, but it also has amazing rewards. I will never tire of my children's hugs and kisses, or dandelion bouquets given in love. I love the feeling of little hands in mine as we go for a walk. My children have helped me see the world in new ways. As I help them learn, I also learn new things. I can honestly say that I am never bored. Before I know it, my children will grow up and leave, eager to make their own way in the world. The art and antiques and leisurely afternoons at bookstores will still be there when they do. "The Soul Tells a Story"
I recently finished reading "The Soul Tells a Story" by Vinita Hampton Wright. She is an editor and writer who is exploring the connection between creativity in spirituality. You can read my full review of The Soul Tells a Story on my website, but I wanted to share with you a few quotes from the book that really resonated with me. "Anyone who has brought up children understands how slowly the balance can shift. For years you have to steal moments, an hour here or there, a weekend when you are lucky, to pay attention to your creative work, while another very creative work absorbs most of your energy -- helping little people get a good start in life." While I can certainly relate to the idea of needing to squeeze in creative work, I had never thought of raising my children as an exercise in creativity, but I guess that it really is. Every day brings with it new circumstances and it does take creativity to respond to them! "God doesn't call you to be successful, only faithful . . .You are called simply to do the work. You give your time and energy to the work. You can't worry about the outcome or how much money you'll make. You can't worry about other people's opinions of the work. What's important is your conviction to engage in the work." As a struggling writer, I think I will post this saying on my wall! The work is what is important, not the results! And lastly, "Your primary job as an artist is to seduce other people into paying attention." Art and Spirituality do have much in common. One of the primary things is that both invite us to take a closer look at life. I hope through my website and blog that I help some of you to pay a little bit closer attention to this wonderful world around us. God is in the little things, if you just take the time to notice. 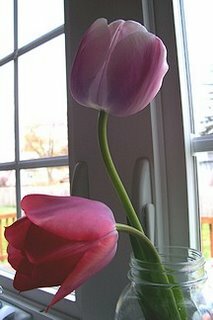 The tulips in my yard are all in bloom. We had some heavy rain a couple days ago and a few were knocked over, so I rescued them and brought them indoors. They were so beautiful, I just had to take pictures, and I thought I would share them with you. Looking at them, I couldn't help but marvel at the creative power of God. He takes the time to create something so beautiful that only lasts a few days, how much more must He love us. Our love for each other is sometimes a conditional love; the Love of Jesus is unconditional and everlasting. He will Love us forever. It hurts Him when we ignore Him, but He still Loves us. Our beautiful Saviour draws us to Him with lovingkindness. He sees into our hearts as nobody else can see. He sees the loneliness, despair, heartaches, and hurt. 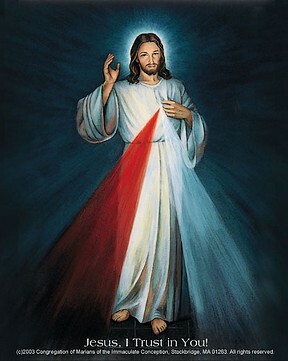 He gently kisses away our tears and applies His healing salve to our wounded hearts. He uses us to be an encouragement to one another and to hug one another for Jesus. Someone once told me many years ago, “You are so fat and ugly that I am ashamed to be seen with you”. That statement devastated me for years. I am still fat, but praise God I’m not ugly anymore because I have Jesus living in me. When this person told me this, I went to my pastor and he gave me this verse. I have received comfort from this verse countless times over the years. It does not matter if we are underweight or overweight, Jesus Loves us. He is not concerned with our outward appearance; He is interested in the condition of our hearts. He is looking for a heart filled with love for Him and for people. How is your heart today? Is Jesus living in your heart? If not, I urge you to give your heart to Him today. Invite the Christ of Calvary into your heart and I promise you that all hell can come against you, but you will have a Peace that only He can give. When most of us imagine the Virgin Mother, we tend to picture a light-skinned woman. We are used to seeing the beautiful Renaissance era paintings of the Madonna featuring a blonde blue-eyed woman and child. Yet prior to that time, the Madonna was depicted as dark-skinned. These "Black Madonnas" as they are known have amazing power, both figuratively and literally. 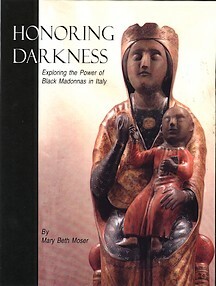 Mary Beth Moser explores the power of these "Black Madonnas" in Honoring Darkness: Exploring the Power of Black Madonnas in Italy. Read the Review. Trying to determine "needs" vs. "wants"
Five-year-old David is in such a consumer stage. Almost everything he sees, he wants. Most of the time, I can distract him with something else, remind him of our purpose in being at the store (which often is to buy something for him), or make a cohesive argument why he actually does not need something. My children have often heard me tell them, "You may want that, but you do not need it," which works most of the time. They have heard this so often that my younger son Isaac felt compelled to tell his grandmother that she didn't actually "need" something that she was picking out at the store! But sometimes, the line between "wants" and "needs" is not so clear cut. I can recall being a child and desperately wanting things. Like my children, I heard "No" alot as well. I don't remember most of the things I wanted, although I still wish that I had been able to take music lessons. I do remember, however, the few times my parents went out of their way to fulfill some request of mine. For example, my mom once drove to a number of stores to find one that was selling the previous week's "TV Guide" because in it was an offer for 72 free animal cards. How I wanted those cards, and I was so happy when the mail carrier delivered them. Today I took the boys to the mall to buy some new underwear for them (an exciting trip to be sure). We also stopped at the art supply store to get a new scrapbook for David and a couple other small supplies. David fell in love with these little kits to build a "pot person." At first, I did say "No," telling David that the package said it was for ages 8 and up (which it did) but as we made our way through the store and David presented his argument as to why he should be able to get the kit, I eventually relented. After all, it was only $1, and it did have some redeeming educational and artistic value. Strictly speaking, of course, David did not actually need this item, and I no doubt violated the great consistency rule of parenting, but I think that on occasion flexibility can be a good thing. This little kit did provide David some momentary happiness. The boys and I came home and put them together (obviously, I needed to get one for Isaac as well). While they will no doubt be broken by this time tomorrow, we did get our dollar's worth out of them. I have no idea if this was one of those items David would have remembered at age 20. I can hear him telling his therapist now, "My mom would not get me a 'pot person'!" It's hard to know what items in my children's lives cross that line from being wants to actually being needs to help their happiness and development. It is always a judgment call, and day by day, I try to make the right ones. "Sammy's Soft Serve," our neighborhood ice cream shop opened today. This is an event equal to a national holiday in our home. We all walked over after supper to enjoy the first soft serve of the season. Due to eczema when I was a little girl, I wasn't able to have ice cream. My mother used to make a frozen concoction using evaporated milk (the only milk the doctor would allow me to drink) - I assure you it was not the same. One day when I was eight years old, my parents decided I could try a little to see if there would be any negative ramifications. After daily mass one evening, we drove to the soft serve shop at the end of the street where the church was located. I was able to have a small vanilla dish. It was love at first bite! Thank goodness, my skin didn't break out, and this was able to be a regular treat in my life. Ever since, summertime has meant regular trips to the ice cream shop. Money was always tight when I was growing up, but somehow my father always found the money for that little indulgence. When I was older and my father worked two jobs, we were no longer able to go to evening mass. My mother and I would often walk to the ice cream shop near our house in the evening. Even today, when I go to my parents' house with the boys, our outing often takes us out for ice cream. I was so thrilled when we moved to our new home last year to discover we were within walking distance (even for little legs) of "Sammy's." For me, those trips to the ice cream shop were one of the best parts of my childhood, and I am continuing the tradition with my own boys. Hopefully, they will remember it with as much fondness. The weather the past few days has been so beautiful - a perfect spring. 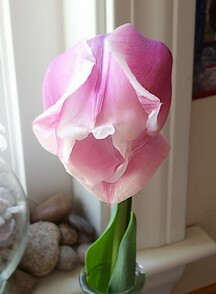 The flowers are blooming and the boys and I have been able to get out and enjoy the sunshine. This afternoon, they were playing happily in the backyard, using our bulkhead as a slide and burying their "Weeble" toys in the sand. Meanwhile, I was taking great delight in a few unoccupied moments to sit on my deck and do some reading while listening to Mozart on my CD player. It was all so wonderful - and God was there. We sometimes search for God only in the big moments of life, and obviously God is there as well. Sometimes, however, the sweetest places to find God are in the simple moments of daily life when you look around, take a breath, and say "this is the good stuff." Thank you, God, for being there in quiet moments. This weekend I received over two hundred emails from people who were hurting. I was still singing praises to Jesus, rejoicing and was happy, but there was a sadness in my heart because of all the people who were hurting. As I was talking to Jesus this morning about all the hurting people, this verse came to my heart. I believe as Jesus said this, He said it with a Heart full of sadness and His voice was choked up and He could barely get it out. This verse came from the depths of our Saviour’s Heart. He says this to us today in the same manner with a Heart full of sadness because we are hurting. Knowing Jesus like I do, I am sure that there were many, many times when He wept in private to His Father. I don’t know all the geographical places in the Bible, or all the historical events in the Bible, but I do know the Heart of Jesus. I know His Heart is tender and loving and He cares when we are hurting. We are told in the Bible that our tears are kept in a bottle. I don’t think a bottle could hold all the tears that our Blessed Saviour has shed over us. What Love He has for us! He is waiting with outstretched Arms for us to come to Him. He wants to kiss away our tears of frustration, disappointment, and hurt. Run into the waiting Arms of Jesus and you will feel a Peace that only He can give. What if this is not your Easter? The Liturgical calendar is so nice and neat. There are forty days of Lent in which we are to focus on our sinfulness and to reform our lives. This is then followed by the triumphant celebration of Easter and fifty days of rejoicing. But what happens when life doesn't fit in neatly with the days on the calendar. What if this Easter finds you in the midst of the desert, unsure of God's love or presence? What if this spring finds you in mourning or in a time of great suffering? What if instead of rejoicing, all you feel is pain? The rituals of Easter are valuable. The yearly reminder of Jesus's triumph over death and sin is needed in our lives. There is comfort in the promise of new life that bursts forth from the tomb. Yet, in the midst of pain and suffering, that comfort can sometimes ring hallow. It can be hard to experience spring and new life when all you see is darkness. The important thing to remember is that your Easter will come. Jesus spent three days in the darkness of the tomb and rose to a glorious existence. Our time in the tomb can sometimes be much longer. It can be weeks, or months, or even years. Darkness can loom heavy. Transformation is often painful and it is often not easy to see the light glimmering at the end. But it is there. Jesus is there with us as we struggle, guiding our footsteps, holding our hand. He has experienced the greatest of human suffering and understands our pain. He will not let go. While you suffer in your own personal tomb, the Easter on the calendar may not have much meaning in your life this year. Try to embrace the meaning of the eternal Easter, however. Your moment will come. You, too, will arise from the pain, a changed and more glorious person for the experience. Jesus has promised. He can conquer all. You can trust Him. Take His hand and don't let go. Whoever you are, come, celebrate this shining happening, the festival of light. You the devout, God's unshakeable lover and you the servant brimming with thanks. Come walk into the joy of your Lord. And you the impoverished faster, come for your wages. You who began before sunrise, come for your stipend. . .
To this one he gives, and on that one he showers rewards. Whether you were a success or whether you only tried, he will greet you, make much of your effort, extol your intention. Let everybody, therefore, crowd into the exhilaration of our Savior. You the first and you the last: equally heaped with blessings. You the rich and you the poor: celebrate together. You the careful and you the careless: enjoy this day of days. You that have kept the fast, and you that have broken it: be happy today. . .
No one need mourn uncountable falls, be they over and over. For forgiveness itself has reared from the tomb. No one need fear death; for our Savior himself has died and sets us free. He confronted death in his own person, and blasted it to nothing. He made it defunct by the very taste of his own flesh. This is exactly what Isaiah foretold when he declared "hell is harrowed by encounter with him." Of course it is harrowed. For now hell is a joke, finished and done with. Harrowed because now it is taken prisoner. It snatched at a body and incredible-lit upon God. It gulped the earth and gagged on heaven. It seized what it saw, and was crushed by what it failed to see. Poor death, where is your sting? Poor hell, where is your triumph? Christ steps out of the tomb and you are reduced to nothing! Christ rises and the angels are wild with delight. Christ rises and life is set free. Christ rises and graves are emptied of dead. Oh yes, for he broke from the tomb like a flower, a beautiful fruit: the first fruit of those already gone. All glory be his, all success and power . . . forever and ever. This afternoon, 5 year old David and I went to the Stations of the Cross at our Church. The sixth, seventh, and eighth graders at our parochial school put it on as a passion play throughout the Church. The kids did an amazing job. Watching them, you really forgot they were young. It was also a very unique production, in that all the supporting characters in the Passion narrative gave their version of events - Pilate, Veronica, Mary, the Weeping Women, Simon, and even Barabbas gave their perspective on the going-ons of the day. It was incredibly moving. It was a little disturbing for a 5 year old, however. There were parts that were very loud and as the soldiers hammered in the nails, he was very concerned that Jesus' blood was going to go everywhere. I assured him it was just pretend. In true David fashion, however, as we were leaving, he said "I sure hope they don't ever want me to be Jesus!" This story was forwarded to me. May it warm your heart this Easter. After being called back in the doctor's office, Edith sat down and when she took a look at the doctor she said, "Dr. Will, why are you so sad? Are you reading your Bible? Are you praying?" she would have to be moving her story to the hospital and said, "Will, I'm very near home, so would you make sure that they put women in here next to me in my room who need to know about Easter." had been married three times, she was hard, cold, and did everything by the book. Edith said, "Phyllis, I wanted to many times, but God told me to wait until you asked, and now that you have asked." Edith Burns took her Bible and shared with Phyllis Cross the Easter Story of the death, burial and resurrection of Jesus Christ. Edith said, "Phyllis, do you believe in Easter? Do you believe that Jesus Christ is alive and that He wants to live in your heart?" did not walk out of a hospital room, she was carried out on the wings of angels. Easter lilies and wish her a Happy Easter. crying; and there shall be no more pain, for the former things have passed away." Phyllis Cross took one look at that dead body, and then lifted her face toward heaven, and with tears streaming down here cheeks, said, "Happy Easter, Edith - Happy Easter!" If you believe in Easter, forward this on. God works in wonderful ways, and to believe in his power is to truly be free. If Jesus had e-mail, he'd do the same for you. As I was reading the Scripture passages for today, I came across the beautiful image of Jesus washing the feet of the Apostles, an act that will be played out in churches around the world at this evening's "Holy Thursday" services. Jesus was instructing his followers to serve, and leading by example. Every time we put another's needs before our own, we follow in Jesus' footsteps. Opportunities abound. Have you served another today? The Gospel readings the past few days have dealt with the person of Judas. Combine that with the just-released news of the ancient "Gospel of Judas" and one has to admit that Judas has been getting alot of press lately. The "Gospel of Judas" asserts that Jesus told Judas to turn him in. Whether or not that is true (and I am placing my bets on not true), Judas does play a major role in salvation history. While no doubt the Jewish leaders would have found some other way to capture Jesus and put him to death, thereby putting the gears in place for the Easter events, Judas did speed up that process. He committed the ultimate act of rejection of Jesus (the other Apostles would have their moments of rejection as well - think of Peter - "I do not know the man!" Admittedly these were on a smaller scale, motivated by fear rather than malice) and yet Jesus died to save all of us, including Judas. Judas was ultimately sorry for what he did - so sorry that he hung himself. If we believe that God forgives all who are truly sorry, then we must believe that God forgave Judas as well. All of us reject Jesus at some point in our lives. We all have our Judas moments when we turn our back on the life Jesus wants us to live. We, too, help to hammer the nails into the cross. But Jesus died for us and He forgives us, even as he breathed his last human breath. As we enter these holiest of days, let us remember our role in the crucifixion and just how much Jesus loves us. He loved us so much that he spread out his arms and died. I really enjoyed this book. It provided a fresh look at work. What if we thought of our work - all of our work - as our gift to God? What if we worked only for Him? It is an interesting thought, isn't it? I also enjoyed his section on bringing out the God-given gifts in your children. Why is it that as parents we are so prone to comparing our children - to each other if we have more than one, or to any other child the same age which comes within viewing distance? It is as if an automatic scale goes off in your head - the other child can read better, speak better, is more coordinated, etc. On the other hand, my child is more polite and better at sharing (at least at this particular moment!). I try so hard not to get into these comparison discussions with other parents, especially since most things parents compare are completely not in our control. I mean, really, I have no say in how tall my children are, and any talents they have are their gifts, not mine. I see no purpose to the whole "my child is better than yours" competitions. I admit, however, that at times I do discuss my children's accomplishments or current difficulties with other parents - it feels good to be able to be proud of my children on occasion and to get sympathy or advice when they are being challenging! Seriously, though, the same advice I always give other parents - "Each child is different. They learn and develop at their own pace" - is advice I often need to take myself. God created each of our children with unique abilities and talents. There are areas that they will always have difficulty with. But God made them the way they are for a reason. While it is hard to see one child excel while another struggles (especially when both are your children), I have to trust that God gave each the tools he needs to live the life God has planned for him. My job is not to try to make my children into someone else or to have them excel at something that they have no innate talent for, but rather to help them make the most of who they are and the gifts they have been given. I want my children to be the people God wants them to be, and I will try my best to help them along that path, and I will try to put the blinders on when tempted by the comparison scale in my head! My blog is now listed with Catholic Blogs. Also, I have included two new links on the Spiritual Woman homepage. One is for a new mailing list - please visit and sign up. New articles of interest will be sent to you - usually about two a month. There is also a link to get the scripture readings for the day as well as a reflection. My father is doing much better - he was actually released from the hospital last night and is now home recuperating. Thank you for all your prayers! And the Days Go By . . .
My Father had his prostate surgery yesterday. Thank God everything went well. He is at a hospital 1 1/2 hours from where I live, which doesn't exactly make visiting an easy proposition, but my mom (who can't travel that distance due to health reasons) offered to watch my children today so that I could go visit with my sister and aunt. I'm so glad that I had the opportunity to go. He is really doing very well. He has managed to retain his sense of humor and the nurse had him up and walking a bit while we were there, so the healing process is starting. It was still difficult, however, to see him in pain and looking rather feeble. My father is 6' 2" tall, strong, silent, and proud. Like it or not, in the hospital you tend to leave a whole bunch of your dignity at the door. It's hard to acknowledge that he is getting old, but he is. Three of my classmates have lost a parent in the past year, and I know that day is coming for me as well. I don't know when that day will be of course, but I get the sense that whether my mom and dad's passing comes this year or twenty years from now, it will be equally painful. I don't know that there is ever a time you are really ready to let your parents go, even though my faith tells me that they would go to a better place. It's just one of those bridges I'm going to have to cross when the Good Lord decides that it is time. Someone posted this on the Catholic Writers Online Group that I belong to and I thought that it was great! Saturday it was 70 degrees outside! It is currently about 30 degrees and it is snowing! We have gone from being in short sleeves to needing hats and coats and boots. David was supposed to start T-ball practice this evening. Somehow, I don't think that will be happening. You know what they say about New England - If you don't like the weather, wait 5 minutes and it will change! David has been very interested in death lately and what happens to you after you die. Death is part of life and I have never tried to shield him or his brother from the subject. I think the first conversation we had about it was when David was only 2 and his great-grandmother passed away. For a very long time I have told him about heaven and how it is a wonderful place. Very recently I introduced the idea of hell and the devil and how you don't want to do bad things because you don't want to end up there. He is beginning to reach that age of reason - where a person knows what is right and wrong and can make the correct decision or feel bad when he doesn't. He knows about the Commandments and that when we do something wrong when can tell God we are sorry and He will forgive us. As much as David knows that heaven is a wonderful place, he never-the-less had some hesitancy about going there: "I don't want to go to heaven because my teddy bear and my Weeble tree house won't be there!" I assured them that there are toys in heaven. Now, of course, I don't know if that is the case or not. I do imagine for the children who have passed on, God would allow their heaven to include their favorite teddy bear. Hopefully, by the time David makes that journey to the other side, he will be much older and will not be concerned with his toys as much. It is an interesting question, though, in thinking about heaven. What will we do there? Will we have jobs or hobbies or our favorite books to read? It is hard to imagine a life with none of the objects we hold dear. If God in His infinite creativity created this world, I imagine heaven holds even greater wonders. With God's grace, I hope that someday I find out! This excerpt from today's Gospel reminds us that for every growth there is a dying of sorts. Real growth comes at a cost. Little children are desperate to be bigger, but even they soon realize that growing up means becoming "too big" to do some things. Older children may want to take that next step to high school or college, but doing so means leaving some friends and familiarity behind. The same holds true for leaving home. Career changes may also involve a similar sense of loss. Getting married requires a change in lifestyle, and a decision to refuse any romantic opportunities that may come your way. Becoming a mother is a transformation. The woman that you once were dies in order that a new version of you may be created. Any true growth comes at a cost, but the price is usually worth it. We come out on the other side a better, more developed person, wiser for the experience. Like the grain of wheat, we can bear much fruit and take the next step on our journey.